The number of drivers arrested after testing positive for alcohol in England and Wales in December fell by 16.5% on the previous year, police have said. 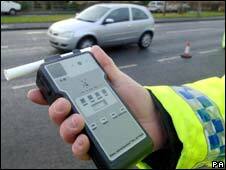 Officers breathalysed 223,423 people during the month - 22% more than in 2008 - and 7,638 were over the limit. Meanwhile, drug-driving arrests fell by 36% - but an "alarming" 18% of drivers tested were found to have taken drugs. Gwent Chief Constable Mick Giannasi said it was "totally unacceptable" that a minority were still breaking the law. The BBC's Ben Ando said the figures showed that the downward trend in drink-drive arrests that began several years ago was continuing. In 1997 the failure rate hit a high of 9.1% and until 2006 it remained around 7-8%. But in the past three years it has been falling sharply. In 2007 it was down to 6%, in 2008 it was 4.5% and in 2009 it was 3%. Among those specifically tested after a collision the figure for last month was 7%. As in previous years, more people under the age of 25 were found to be over the legal alcohol limit than those in older age groups, although the total number of young people arrested was lower than in the past. Chief Constable Giannasi, the Association of Chief Police Officers' lead on road safety, said police were "encouraged by the decreases in the statistics in most areas". But he said: "More drivers than ever before were breath tested over the holiday period - 223,423 - and despite all the messages that drinking and driving is dangerous and illegal, some people still do not get the point. "There were still 7,638 drivers on our roads posing a threat to themselves and others and that is totally unacceptable. "Alcohol and drugs can impair your ability to judge speed and distances, reduce concentration and delay reaction speed." Road safety minister Paul Clark welcomed the news that fewer people were found to be driving when over the limit. He said: "Successful government campaigns and police enforcement have made drink-driving unacceptable and reduced the number of people killed in drink-drive accidents by almost three quarters since 1979. "These encouraging figures show that this vital message is continuing to get through and further cut the numbers of drivers who put others at risk by getting behind the wheel after drinking." But Sarah Fatica, from road safety charity Brake, said Britain still tested fewer than 1% of its motorists annually. This compares with 50% in New Zealand, where tough tactics since the 1980s have cut by two thirds the number of road deaths linked to alcohol. "As a country we're still lagging behind other world leaders," she told the BBC News website. "In New Zealand, they block off whole sections of road and test everyone who comes through. "The effect is drivers don't think they can get away with drinking, so they don't do it. Here the numbers being tested have gone up a bit, but we're nowhere near sending the message that if you do it, you will definitely get caught. "We need better leadership from government to change that. "Also, we should remember drink-driving goes on all year and police need the funds to tackle it intensively all year round, not just at Christmas." Edmund King, president of the AA motoring organisation, said there was particular concern among the public about drugs. "More effort needs to be directed at drug-driving in the future," he added.